So my hubby just took me for my first ever ride in a Porsche today. I'm a relatively new convert to sports cars (my sportiest car was a 2008 VW GTi), but he has been a Porsche enthusiast most of his life. We test drove a 2001 Boxster S and it was love at first engine growl! I am now over the loss of my GTi and am ready to move on. 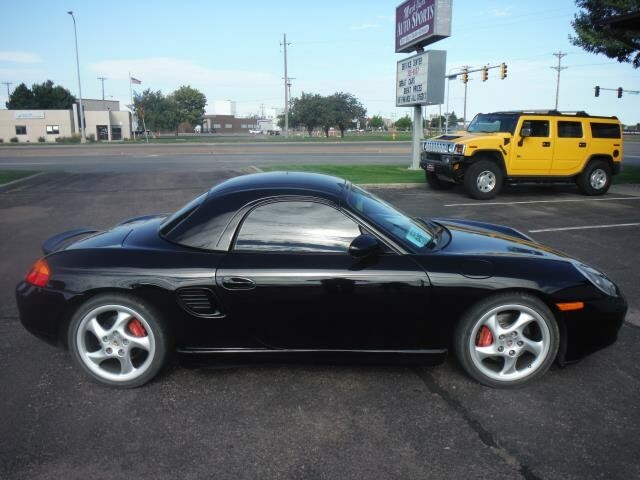 Pretty sure I want the Boxster more than hubby does! Anyway, we are still in process of negotiation, which is excruciating. Until then, I will read as much as I can on this forum to learn the language so I don't feel like such a...girl. Thank you for having me! Welcome to the forum! Surely you will love a boxster and hope u able to buy the right one. Try to check if the IMS was already replace. Read all you can to avoid pitfalls of not doing due deligence before buying, it pays off! We are now Porsche owners! After much horsetrading and patience, we came out on top. We take delivery next week! In the meantime our dealer is installing new tires and brakes all around, new trunk struts and new window motors. I have learned so much in the past few days! We got a thick packet of history and the car seems well-maintained. IMS bearing looks to be original, but car has survived to 113k miles and should be OK until we have the clutch replaced. Would like to get the wheels painted too to give a little facelift. Can hardly wait for Friday, I hope we can eke out a few more nice fall days for driving before Winter sets in here in South Dakota. Congratulations! You're going to love this car. Drive and enjoy your car as long as you can before you have to put it away. Put it away with fresh oil and inspect the oil filter for anything weird....take pics and post if you're unsure of anything. Buy an ignition switch (~$15) and either replace your or keep it on hand. It will be the source of really weird stuff, like lights that don't work right or a stereo or A/C that work sometime and sometimes they don't! Research drain locations and clean your top drains! Nothing hard here but can save you major issues down the line. Stay on this forum....search and search! This forum makes these cars fun and affordable!